Release Date: April 28th, 2006 (Landmark Sunshine Cinemas and Lincoln Plaza Cinemas) by Palm Pictures. The Cast: Maggie Cheung, Nick Nolte, Béatrice Dalle, Jeanne Balibar, Don McKellar, Martha Henry, James Johnston, James Dennis. In French and Cantonese with subtitles. BASIC PREMISE: Emily (Cheung) leaves her life of drug addiction and communicates with her father-in-law (Nolte) in order to reach her son. 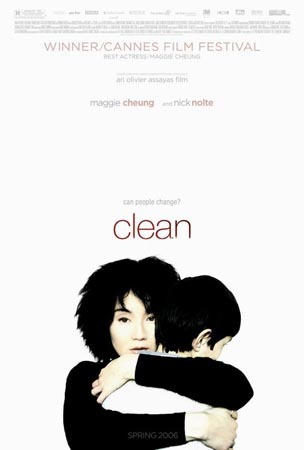 ENTERTAINMENT VALUE: Maggie Cheung gives a strong performance as Emily, but fails to save Clean from sinking from too many contrivances and pointless scenes. After serving half a year in jail for drug possession, Emily, the widow of a rock singer named Lee (Johnston), decides to start her life from scratch, so-to-speak—without drugs—in order to spend time with her distant son. Soon enough, she tracks down his father’s parents, Albrecht (Nolte) and Elena (Dalle), who take care of him. Nick Nolte, as grandfather Albreicht, does his best to enliven the film with his performance, but the script doesn’t give him enough range of emotions. Writer/director Olivier Assayas has plenty of talent with his visual style but, as a writer, he fails to make you connect with any of the characters. On top of that, very few scenes feel realistic and engaging—it would have been nice to include more scenes showing Emily interacting with her son. By the predictable, contrived ending, the only thing stands out from this unsurprising film is Maggie Cheung who radiates in every scene. Too bad the dull plot couldn’t radiate as well. INSULT TO YOUR INTELLIGENCE: Too contrived and predictable.